The Rosary is my lifeline. I don’t always pray it well, and I don’t always give it the attention I should, but when I do, it is an incredible source of grace and peace, and it has helped me to be calm and focus on what truly matters in times when everything seemed uncertain. The way in which I pray the Rosary has changed and matured gradually over the years, from a sort of empty, rote recitation to a rich, purposeful meditation. The mysteries that once seemed straightforward to me are now immeasurably deep and full of nuanced meaning; I take something different from them every time I reflect upon them. The Rosary is a comforting prayer: the repetition of familiar verses, reflections on the lives of Jesus and Mary, and a tangible cord to hold on to. We experience the world with our senses, and through sacramentals like the Rosary, God gives us a way to reach out toward Him physically, to touch something sacred. Some days my prayer is dry, and it is willpower that keeps my fingers running over the beads. But I keep up with it because I know it still has meaning—perhaps even more meaning when it is difficult and I do it anyway. I also persevere in prayer for the sake of muscle memory: if I form good habits, they will start to come more and more naturally to me, so that in times of trial, reaching for my Rosary and turning to God will become instinctual. At least, that’s the goal. All of my clearest spiritual and theological insights have come while praying the Rosary, which illustrates to me that they don’t come from my own intellect. They are gifts from God that come when I make myself receptive to His grace, when I place myself in the hands of His Mother. 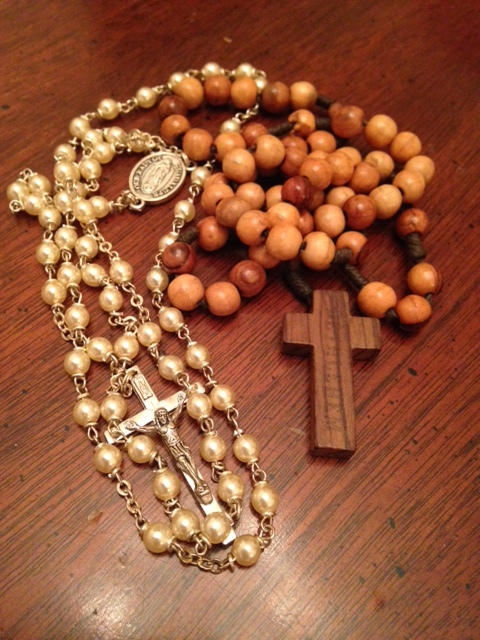 Praying the Rosary helps me to look toward Mary’s example of submitting fully to God with a wholehearted yes. Its mysteries remind me of the beauty and complexity of our faith, of the intricate workings of love that came to save the beautiful and broken world we live in and became inextricably entwined with our humanity. There is so much goodness to be savored in these mysteries, and there is so much more I have yet to learn by sitting at His feet and holding the hand of His Mother—my Mother, our Mother—through my Rosary beads.